Sorry for delay: I thought I was #263! Looks like a church but what a wierd steeple if it is..??? A Chinese temple outside China? European country that borders the Mediterranean Sea? Jube: yes. Therefore GT: no. Sheer luck, I just happened to enter the right key-words into a search engine - and up it popped! I know the answer, but Lara got there first. But your PM was not right!!! That's because you were being fussy about the name. I just recognised the building as soon as I saw the photograph. Greenrider Tresa, you're nearly there. I've had two correct answers but I'll give it a day or two to see if GT gets it. 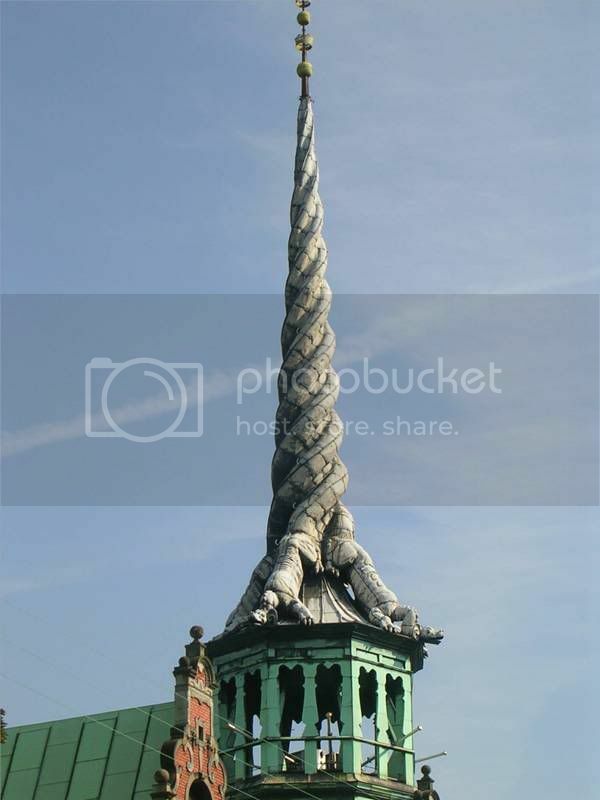 Well this was what I've found out about it ... the Danish Stock Exchange with the Borsen Spire on top in Copenhagen. Looks like a lizard to me. Yes, it's the spire on the old 'bourse' in Copenhagen; shot while attending Eurocon 2007. The animals are SUPPOSED to be aligators! I'll have to hunt for the photo I had for the next WitW. Børsen (The Stock Exchange) is a very impressive building situated in central Copenhagen and was built by King Christian IV during 1618 - 1624 as a symbol of Copenhagen as a trade centre and metropolis. The building was designed in the style of the Dutch renaissance architecture and is famous for its "dragonspire". The spire from 1625 is shaped as the tails of four dragons twined together and was said to guard the building against fire and enemies. Above the spire are three crowns; symbolizing the then united kingdoms of Denmark, Sweden and Norway. Originally Børsen was used for the exchange of wares and this is why it is nominated as one of the first exchanges in Europe. It housed the Danish stock-market until 1974, but is today owned by the Chamber of Commerce, which is an independent private business association for trade and services - and the building is not a museum. Don't blame me: I didn't write it. I must say that I thought the Renaissance was a century or two earlier. In England 17th C was Jacobean.